General Motors has announced that its personal mobility brand Maven is currently working with the city of Los Angeles to create more sustainable and convenient transportation options for those living in the famously car-reliant city. Maven’s car-sharing application is in line with LA Mayor Eric Garcetti’s plan to leverage multi-modal transportation solutions to advance mobility and encourage more EVs in the market. Garcetti’s vision involves reducing barriers to mobility and exposing all LA neighborhoods and communities to transportation electrification. Since launching in October of last year, the Maven City car-sharing program in LA has maintained an average 56% month-over-month member growth. Maven says it plans to leverage this existing platform, as well as “in-city infrastructure, fleet management capabilities, and operational insights” to help realize the City of Los Angeles’ Sustainable City pLAn. Maven members will get to inform the co-creation process, providing key insights for infrastructure and transportation planning. Maven Los Angeles plans to make 100 Bolt EVs available, allowing for drivers to total nearly 250,000 all-electric miles per month. 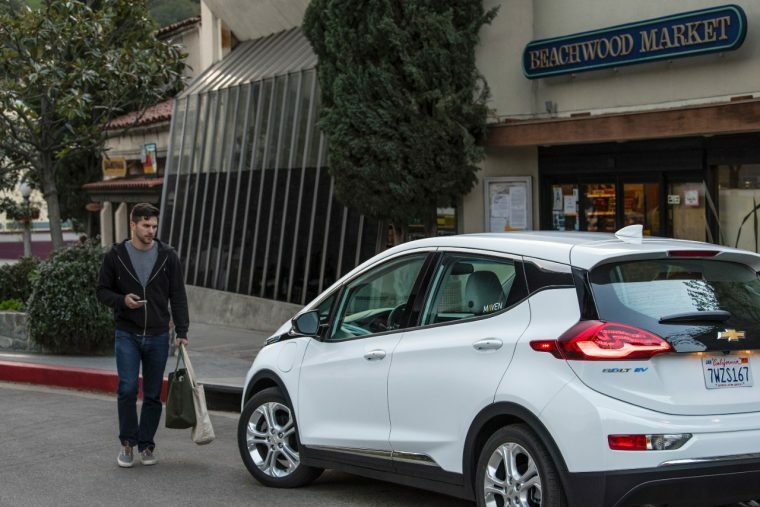 To support the Bolt’s introduction, LA is working to build a more effective and robust EV charging network, and for a limited time, drivers will be able to receive free charging from the entire EVgo Freedom Station network throughout California. Maven is also planning to add the Bolt EV to San Diego and San Francisco.